I live in a one-bedroom apartment on the 5th floor of a 5-floor walkup. During the day, the sun beats down on the aluminum roof of my building and really heats up the apartment. During the summer, temperatures can exceed 90 degrees, which, as we all know, can be pretty bad for brewing tasty beer. I’ve been mulling over some potential solutions to this problem, while keeping in mind the lack of space in my apartment, and came up with a space-saving DIY project that can be accomplished with minimal work that won’t break the bank. My idea was to create a kitchen table that doubled as a fermentation chamber. I ran my idea by one of our more technically skilled club members, Niall, and then we got to work. I went to the local Home Depot and picked up a 5.2 cu. ft. chest freezer. They can be found on sale throughout the year, and usually range between $100-200 depending on the size you buy. Back at the apartment, and five flights of stairs later, I was ready to take measurements. With a depth of 22 inches and a width of 30 inches, I would need a long wooden block that would function as a two-person table, yet still allow me to open the freezer and access its contents. The freezer also had plastic lining that ran along the outside. The lining stuck up just a few millimeters, but would need to be accounted for so that the wooden block would fit snugly on top. Based off of those measurements, Niall picked up a 4 foot x 2 foot birch butcher block. We then cut grooves into the areas that would be resting on top of the freezer’s plastic liners. After chiseling away all access wood along the grooves, the block was ready to test. Back up another five flights of stairs, and after a tense “moment of truth,” we found that the block fit perfectly. 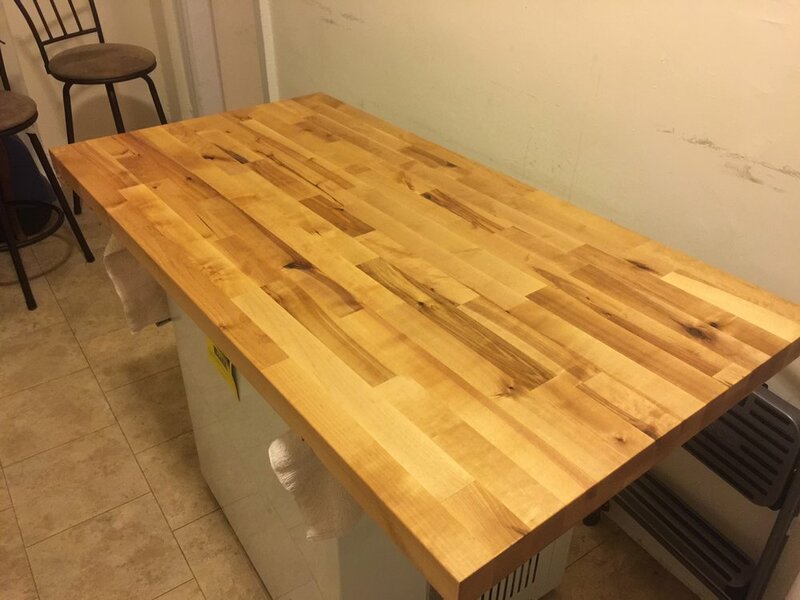 After a few coats with butcher block conditioner (which helps protect the wood by keeping out moisture,) we covered the freezer lid with epoxy and set the butcher block flush with the back of the freezer. This will allow it to open and shut without a problem. We then filled a couple of carboys with water and set them on top of the freezer to help weigh down the butcher block as the epoxy resin cured. 24 hours later, I removed the carboys to find the butcher block secured to the lid of the freezer. I then purchased a dual stage temperature controller, which I mounted to the side of the freezer using Velcro sticky back tape. The controller will allow me to dial in what temperature I want to ferment my beer at down to a decimal. I conditioned the wood a few more times, and the finished product looked great. It takes up minimal kitchen space and gives me control over a very important part of the beer-brewing process.